Although the machine was well conceived and the case offered a nice design, it had no success in the private sector because of its poor compatibility with the IBM-PC standard. However, about 1000 systems were sold to the French Department of Education as network servers (first networks established in schools, called 'Nano R�seau'). 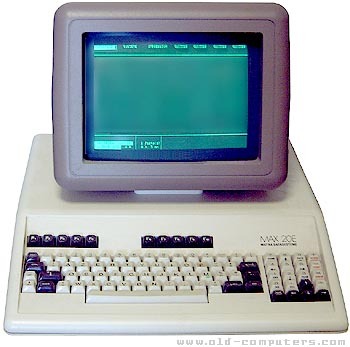 Furthermore, as the computer was built by Comterm-Matra, a Franco-Canadian subsidiary of Matra, the Canadian Department of Education obliged schools to order the MAX-20 instead of the Apple Macintosh. Thee first deliveries occurred in early 1985. One year later, after having delivered 9000 computers, Comterm-Matra met with financial difficulties and ceased production. Thus, the machines quickly became obsolete and unusable in schools. see more Matra MAX 20 Ebay auctions !